How will climate change impact water quality? Scientists are trying to understand how climate change will impact water quality in the Southwest. 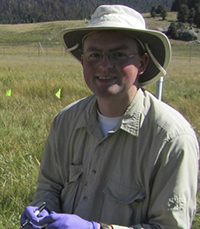 Researchers have set up monitoring stations in the Valles Caldera and they are finding out that certain changes are taking place that influence water quality. Paul Gabrielsen and his fellow researchers from New Mexico Tech (2012) have discovered that dissolved organic carbon (DOC) is being washed into the streams. The flow path includes a very important zone called the Hyporeheic Zone (HZ) where geochemical and biochemical reactions (with the help of microbes) takes place. You could think of the Hyporeheic Zone as the "liver" of the stream that is filtering the water through bio and geological processes to maintain high water quality (Gabrielsen 2011). After a severe wildland fire followed by a severe weather event such as a monsoon, the HZ is overwhelmed with flood waters. Scientists are trying to figure out what all the variables in the HZ might be and what impact climate change will have on the system. There is still a lot of work to be done that will require ongoing monitoring and analysis. Paul Gabrielsen and his fellow researchers monitor the dissolved organic carbon as it travels down the Jemez River meander field site. Hyporheic Dissolved Organic Carbon Dynamics in Valles Caldera National Preserve, GSA presentation 2010-2011 Gabrielsen et al. with graph courtesy of Jesús Gomez. Under Labs and Activities you'll find a student lab sheet for students to interpret and learn more about dissolved organic carbon and the hyporeheic zone. EPA and What Impacts Will Climate Change have on Water Supply?